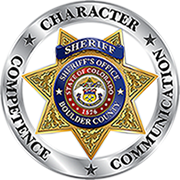 The Boulder County Jail provides opportunities for inmates to continue educational learning or recreational reading at the Library. Provided once or twice weekly, depending on the inmate’s housing; self-service bookcases are also provided in most housing units. Materials available are responsive to the interests and educational needs of users and are supported by an on-line computer catalog. Resources are supplemented by local, regional, and state libraries; law libraries and inter library loan services. Staffed by the Corrections Library Program Coordinator. Member of the Central Colorado Library System. Approximately 5,900 inmates use the library services in 2009.